Marble Polishing is a very skilled process that can only be done by professionally trained technicians. In order to have marble floors successfully polished, to engage with a professional marble cleaning company is the best option. This article aims to break down the most basic part of marble polishing for you and explains how marble polishing can actually help with the most common problem of marble floors, i.e. the lack of shininess. There are many reasons for which different marble floors need polishing. Indeed, marble polishing is one of the most versatile solutions to many serious problems that other solutions cannot solve. However, the most common one is the lack of shininess of the marble floor. This lack of shininess is usually caused by the unevenness of the surface on a microscopic level. A shiny marble floor has a very smooth surface and thus leads to the even reflection of light from all directions. As a result, we perceive the floor as shiny by the abilities of the surface to reflect light evenly. However, as time goes by, with small scratches over time, the surface of the marble floor becomes less and less smooth. As a result, light is now reflected on an uneven basis, and thus the perception of the surface to us becomes less shiny. This lack of shininess usually can only be solved by marble polishing process, which is going to be explained in the next section. Marble polishing is able to address the problem of lack of shininess simply because it makes the surface of the marble floor smooth again. By utilizing very hard but very fine objects like a diamond, marble polishing machines are able to eliminate the zigzag shapes of the marble flooring surface. 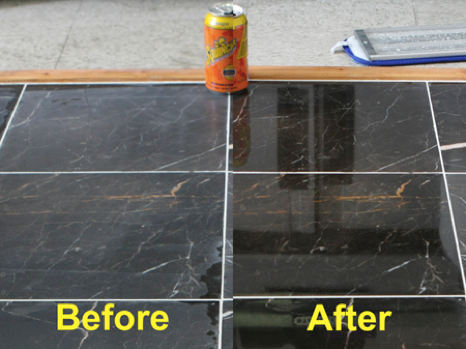 As a result, with very fine and gradual grinding conducted by our special marble polishing machine, the surface of the marble floor can be restored to its original smoothness. As a result, we perceive the much smoother surface as shinier, as light is reflected a lot more evenly now. The complete shininess of the marble surface can thus be returned to our customers, like you. A lot of times, cleaning after polishing is often neglected even by professional technicians. However, cleaning after polishing is crucial to maintaining the long-term health of the marble floor surface. The reason for this is that the polishing process may generate a milky liquid solution which contains the small marble particles that are grinded off from the floor. This solution if left uncleaned, even a very small amount, can cause great damage to the floor after it is dried. Thus, thorough cleaning is highly recommended after any grinding process. Indeed, the marble polishing is very complicated in nature. Furthermore, the marble polishing machine, due to its size, weight and power, may pose damage to the surrounding if not controlled well, especially by non-professional individuals. As a result, we recommend you to engage with professional marble polishing companies to perform any polishing process. For a more detailed explanation of marble polishing, you may want to refer to this website that gives you a lot more information.